US Senator John McCain has said it was "wrong" how wealthy Americans avoided the Vietnam War draft in a remark which many view as an attack on Donald Trump. The rich "found a doctor that would say that they had a bone spur", he said in an interview with C-SPAN, appearing to refer to Mr Trump's 1968 diagnosis. Mr McCain on Monday faulted "the system" for allowing Americans like Mr Trump to evade service. The remark is the latest in a string of clashes between the two Republicans. In an interview on Sunday marking the 50th anniversary of being shot down over North Vietnam, Mr McCain spoke about his service as a Navy pilot and his experience as a prisoner of war. "One aspect of the conflict, by the way, that I will never ever countenance is that we drafted the lowest-income level of America, and the highest-income level found a doctor that would say that they had a bone spur," he said. "That is wrong. That is wrong. If we are going to ask every American to serve, every American should serve," said Mr McCain, who refused an offer of early release by his captors despite years of torture at the "Hanoi Hilton" prison. Mr Trump received five military deferments during the 1960s - four for academic reasons and one for bone spurs, or calcium build-up in the heels. During his presidential campaign, he could not recall which heel had been affected and later said the issue had been "temporary" and "minor", adding that "over a period of time, it healed up". In a separate interview on Monday with ABC News' The View television programme, Mr McCain said he did not consider Mr Trump a draft-dodger. But he added: "I feel that the system was so wrong that certain Americans could evade their responsibilities to serve the country". Mr McCain has become a frequent - although veiled - critic of Mr Trump, who as a candidate in 2015 questioned whether the Republican senator was a war hero. Media captionWhat makes a hero? "I like the ones who aren't captured," Mr Trump remarked. Last week, Mr McCain denounced the "half-baked, spurious nationalism cooked up by people who would rather find scapegoats than solve problems" in a perceived slight at Mr Trump's so-called America First policy. When asked for a comment after the speech in Philadelphia, Mr Trump said "people have to be careful because at some point I fight back." 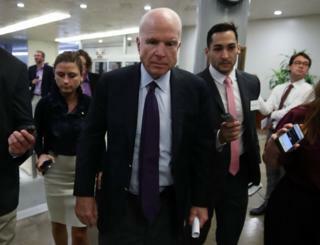 Mr McCain, in response, said: "I have faced tougher adversaries." He has also played an instrumental role in sinking the Republican healthcare legislation and has criticised the White House for not revealing more details about the deaths of four US servicemen in Niger earlier this month. 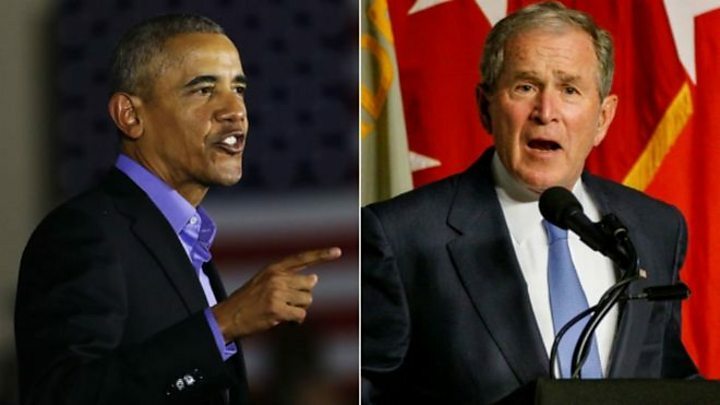 Also last week, former presidents George W Bush and Barack Obama criticised the sitting US president without using his name.